The Best Way to Build? Finding the best construction methodology is almost like deciding whether the beginning of the toilet paper should go above or below the roll. It’s all personal preference, so we asked what top market experts liked best at Bisnow’s Construction & Development Summit last week.. It varies by product and even within product type, we learned. 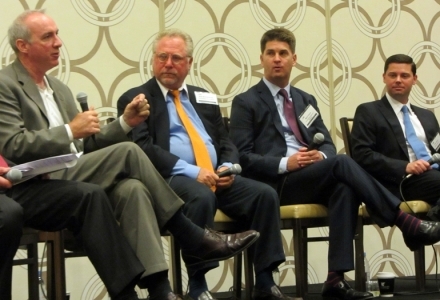 Take multifamily mixed-use specialists Brian Winley of Century West Partners and Related California’s Gino Canori (flanking Sonnenblick Development’s Bob Sonnenblick and Panattoni’s Mark Payne). While Brian says GMP is his preferred method, Gino likes cost-plus. Bob notes the timing of when contracts are signed also is important—he signs his at 3% drawings (that’s industry lingo for 3% done… but you all knew that).